On this date in 1651, Wilhelm Biener, late the chancellor of Tyrol, lost his head to the rancor of Tyrol’s landed aristocracy. A barrister by training and eventually a judge, Biener or Bienner (English Wikipedia entry | German) transitioned into a court position under Leopold V, Archduke of Austria. Leopold’s death in 1632 left a four-year-old heir, Ferdinand Charles; the boy’s mother, Claudia de’ Medici, leaned increasingly on Biener’s counsel as she ably kept Tyrol in order (and out of the devastating Thirty Years’ War) while little Ferdinand aged towards his majority. As a commoner, no dynastic entanglements of his own divided his attentions from the state’s own interest, a fact that Claudia de’ Medici recognized in elevating Biener to the chancellorship in 1638, and that the land’s magnates recognized in the strictly levied taxes Biener extracted from their resentful purses. 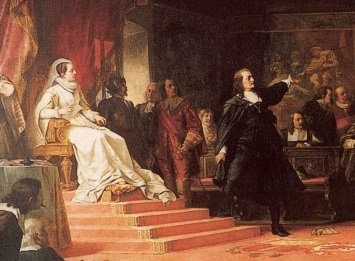 Detail view (click for full image) of Karl Anrather’s 1891 painting of Wilhelm Biener holding forth against the Tiroler Landtag, from the Ferdinandeum at Innsbruck. For Biener, the volcano opened under him with the death of his patron Claudia de’ Medici on Christmas Day 1648. Her boy Ferdinand Charles was all of 20 years old now, wet behind the ears and enamored of courtly profligacy. Despite his affection for Biener and his long service to his mother, the young prince would vacillate on sparing the consigliere until it was too late. Biener’s enemies struck with a secret trial accusing him of wetting his own beak on the imposts he had imposed on Tirol; the account below of what followed from a travelogue probably reflects the posthumous myth of Biener more faithfully than it does the real man. [Biener] was ultimately condemned, in 1651, to lose his head. Biener sent a statement of his case to the Archduke Ferdinand Karl; and the young prince, believing the honesty of his mother’s faithful adviser, immediately ordered a reprieve. The worst enemy and prime accuser of the fallen favourite was Schmaus, President of the Council … and he contrived by detaining the messenger to make him arrive just too late in Rattenberg, then still a strong fortress, where he lay confined, and where the sentence was to be carried out. Biener had all along steadfastly maintained his innocence; and stepping on to the scaffold, he had again repeated the assertion, adding, “So truly as I am innocent, I summon my accuser before the Judgment-seat above before another year is out.” When the executioner stooped to lift up the head before the people, he found lying by its side three fingers of his right hand, without having had any knowledge that he had struck them off, though he might have done so by the unhappy man having raised his hand in the way of the sword in the last struggle. [more likely they were folded in prayer. -ed.] The people, however, saw in it the fulfilment of the words of the bishop, as well as a ghastly challenge accompanying his dying message to President Schmaus. Nor did they forget to note that the latter died of a terrible malady some months before the close of the year. Biener’s wife lost her senses when she knew the terrible circumstances of his death; the consolations of her director and of her son, who lived to his ninetieth year in the Franciscan convent at Innsbruck, were alike powerless to calm her. She escaped in the night, and wandered out into the mountains no one knows whither. But the people say she lives on to be a witness of her husband’s innocence, and may be met on lonely ways proclaiming it, but never harming any. Only, when anyone is to die in Büchsenhausen, where her married life passed so pleasantly, the ‘Bienerweible’ will appear and warn them. Living on in Tyrol folk tradition, Biener took a leap into the Romantic-era national consciousness thanks to writer Hermann Schmid, who popularized Biener’s legend with a 19th century historical novel, The Chancellor of Tyrol; public domain versions can be read online in two volumes (1, 2); a theatrical adaptation by Josef Wenter is still staged to this day. 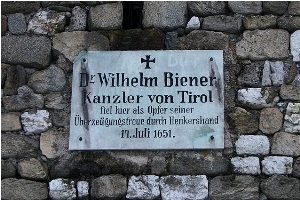 It’s possible that this imprint on the Zeitgeist led a Bohemian writer to christen his fictional executed outlaw “Vilem” in the Czech poem Maj.
Marker honoring Wilhelm Biener in the Austrian Tyrol town of Rattenberg, where Biener was executed on July 17, 1651.